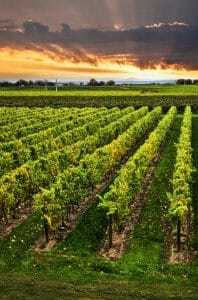 The Niagara region is known for its wine, and you can easily spend weeks on end touring every vineyard and tasting every varietal. However, if you only have a few days (or hours!) in Niagara Falls, there is one winery you can’t miss: Trius Winery. Award-winners several times over — and for several years in a row — the winemakers of Trius at Hillebrand are renowned for crafting some of the best bottles in the world, let alone the Niagara region. If you are eager to taste some of the best wine Niagara wine country has on offer, you can’t miss this amazing Hillebrand winery. Though Niagara Falls is more than 12,000 years old, the region hasn’t been known for wine very long. In fact, many of today’s most renowned wineries began in the second half of the 20th century — as is the case with Hillebrand Estates in Ontario. After the Second World War, Canada had a reputation for poor-quality alcohol; even its winemakers focused on proof over taste. Canada’s vineyards were filled primarily with high-yielding, tolerant Labrusca (fox) grapes, which were later mixed with cheap, bulk wine — or worse, grape juice. The result was sticky, sweet, and strong wine coming from most of the nation’s vineyards. Hillebrand was among the first wineries to change this perception. In 1979, Hillebrand was built in the Niagara region to cater to a different class of wine drinkers. Growing Riesling, Gewurztraminer, Vidal, and Marechal Foch grapes instead of the typical fox grapes, Hillebrand was able to produce new and exciting wines that, before the winery’s founding, were only available from expensive European importers. Not only was the winery among the first to experiment with new varietals, but it was the first to produce Niagara’s iconic and unique icewine. After just 10 years, Hillebrand was able to diversify into different brands, establishing Trius first as a label for specialty blended reds, then as a leader in delectable Niagara wines. Not long ago, Trius became such a beloved brand that it has taken a dominant role at the Hillebrand Estates. If you enjoy Trius labels at home, you can visit this Hillebrand winery to see the grapes growing in the fields and learn exactly how your favorite vintages get made. Hillebrand has long been an innovator in the Niagara region, and Trius continues that legacy with a long list of award-winning wines, which you can taste on your next trip to Niagara. Trius Red. The first wine Trius ever produced continues to be among the best at the winery. A combination of Cabernet Franc, Cabernet Sauvignon, and Merlot grapes comprises this red blend, which has won several trophies and awards during its 30 years on the shelf. Barrel-Fermented Chardonnay. Light and fresh, with a distinctive mix of sharp apple and musty oak, this sparkling wine is full of dimension. In a world where Chardonnay is often scoffed at for lack of depth, this wine certainly stands out. Pinot Noir. Crafted from grapes in a single vineyard, this wine should prove Trius’s supremacy among Niagara wineries. Boasting deep, full flavors like black cherry, black tea, and leather, this Pinot Noir exemplifies its varietal in the best ways. Cabernet Franc Icewine. Icewine is one of Hillebrand’s specialties, so you must sample their latest showcase icewine while in town. Frozen on the vine, the Cabernet Franc grapes are hand-harvested and pressed to produce an utterly matchless wine experience. The balance between sweetness and acidity makes icewine a perfect pairing wine, so you can try it at the Trius Winery Restaurant. If your next Niagara trip is a romantic one for you and your significant other, you should plan a Couple’s Wine Country Escape. If you are obsessed with anything sparkling, you can schedule a Tasting Stars tour. If you want a historic winery experience, you might register as a Trius Wine Club Member and sign up for The Grape Stomp to be followed by a trip Into the Vault. Trius offers visitors 18 distinct winery tours — most of which come with additional activities, like spa treatments and nights out in Niagara Falls — but there are several other ways to taste and explore Trius at Hillebrand. 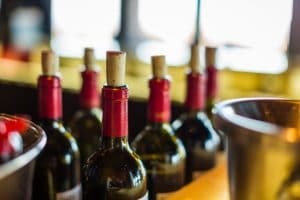 For example, for an immaculate pairing with food, you cannot miss lunch or dinner at Trius Winery Restaurant, which is often rated among the best places to eat in the Niagara region. You can also purchase the best Trius wines online, through their store, or in wine shops throughout the area and beyond. Trius has a reputation for excellence, and a trip to Trius is an excellent way to spend your vacation. No matter what your plans are for your next Niagara tour, you must devote some time to Trius at Hillebrand.